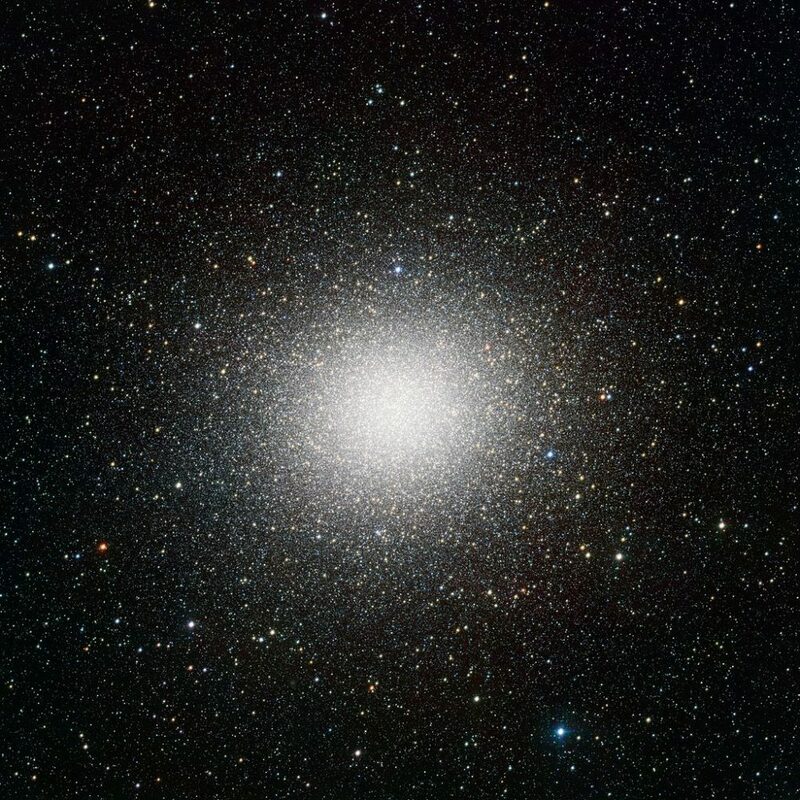 Hosting about 10 million stars within a region about 150 light years in diameter, Omega Centauri is the brightest, largest, and most massive globular star cluster in our galaxy, the Milky Way. The cluster lies at a distance of 15,800 light years from Earth. It has the designation NGC 5139 in the New General Catalogue. 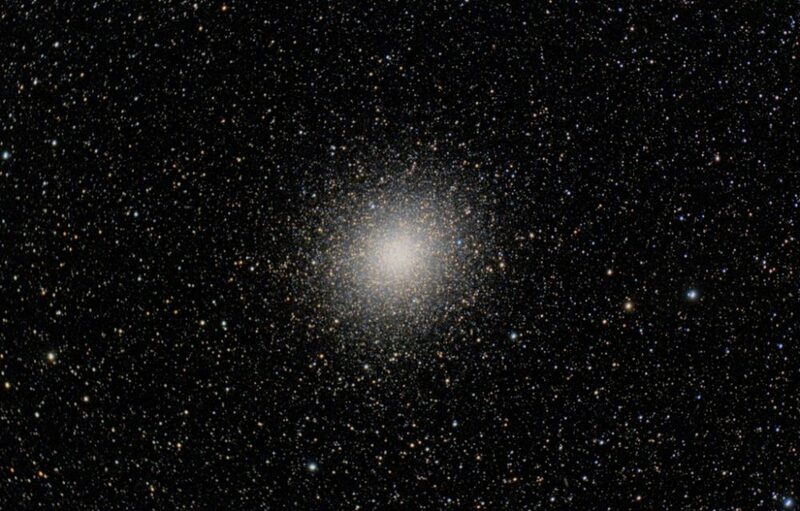 Omega Centauri is quite distinctive from the other 200 or so globular clusters found in the Milky Way, which has led scientists to theorize that it may have an alternate origin as the core remnant of a dwarf galaxy that was disrupted and destroyed in an encounter with the much larger Milky Way. Globular clusters orbit our galaxy outside the galactic disk. They contain tens of thousands to millions of member stars that are bound together by gravity, and remain intact for billions of years. Stars in other clusters generally have a similar age and chemical composition. 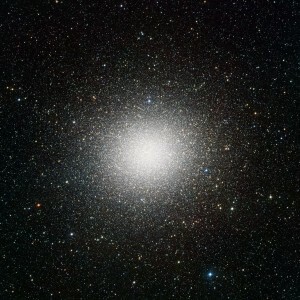 Members of the Omega Centauri cluster show a wide age range, from 12 billion years to relatively young, and chemistry. 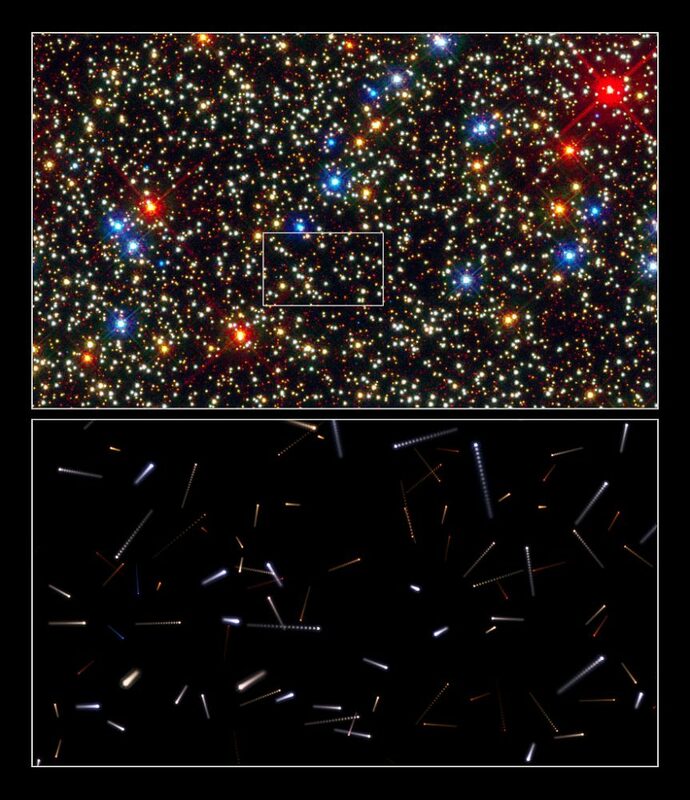 It is the presence of different stellar populations that has led to speculation that Omega Centauri is not really a globular cluster, but a dwarf galaxy stripped of its outer stars, or what is left of a nucleus of a dwarf galaxy, one torn to shreds by the gravity of the Milky Way Galaxy. NGC 5139 is home to several million Population II stars. The estimated age of the cluster is about 12 billion years. The stars in the cluster are believed to have formed over a period of 2 billion years, with several peaks in starburst activity. 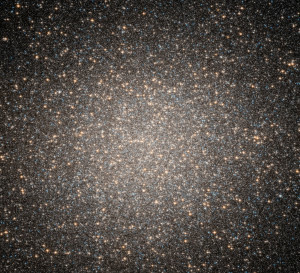 The central region of Omega Centauri is so packed that the stars are estimated to be only 0.1 light years away from each other. In 2008, a study showed evidence of an intermediate-mass black hole at the core of Omega Centauri, based on observations made by the Gemini Observatory in Chile and the Hubble Space Telescope. Hubble images revealed that there was a greater concentration of stars near the centre of the cluster and instruments at the Gemini Observatory showed that stars closer to the centre of Omega Centauri were moving at greater speeds than stars father away. This led the researchers to conclude that there was unseen matter at the centre of the object that was interacting gravitationally with the nearby stars, most likely a dense, massive object like a black hole. They calculated the mass of the black hole at 40,000 solar masses. 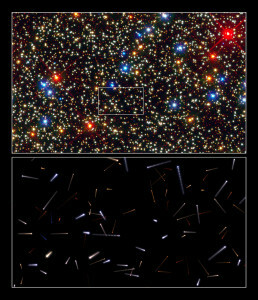 The findings of the study were published in a paper titled “Gemini and Hubble Space Telescope Evidence for an Intermediate Mass Black Hole in Omega Centauri” by Eva Noyola (Max Planck Institute for Astrophysics in Germany & University of Texas, USA), Karl Gebhardt (University of Texas) and Marcel Bergmann (Gemini Observatory), published in the April 10, 2008 issue of the Astrophysical Journal. More recent research has disputed these findings, but has not entirely ruled out the presence of a black hole. However, the maximum mass of the black hole was limited to 12,000 solar masses. Omega Centauri is visible to the unaided eye, but best seen through a telescope. When observed from a dark area, it appears almost the size of the full Moon. The cluster can only be seen at certain times of the year from the northern hemisphere. The best time to observe it is in the evenings from late April to early June. The object is visible from January to April as well, but observers need to stay up late or get up before sunrise to see it. For observers south of the equator, the best time to see Omega Centauri is from March through October. Omega Centauri can only be seen from locations south of 43°N. It lies about 13 degrees to the northeast of Gacrux (Gamma Crucis), the star located at the top of the Southern Cross. Omega Centauri can be located in the sky using Spica, the brightest star in the constellation Virgo and one of the brightest stars in the sky. Omega Centauri and Spica transit together, i.e. they reach the highest point in the sky and appear due south at the same time, only the cluster transits some 35 degrees south of Spica. 10 degrees is roughly equal to the size of a fist held at an arm length. Spica can be found by following the arc of the Big Dipper‘s handle. The imaginary line leads first to Arcturus and then to Spica. 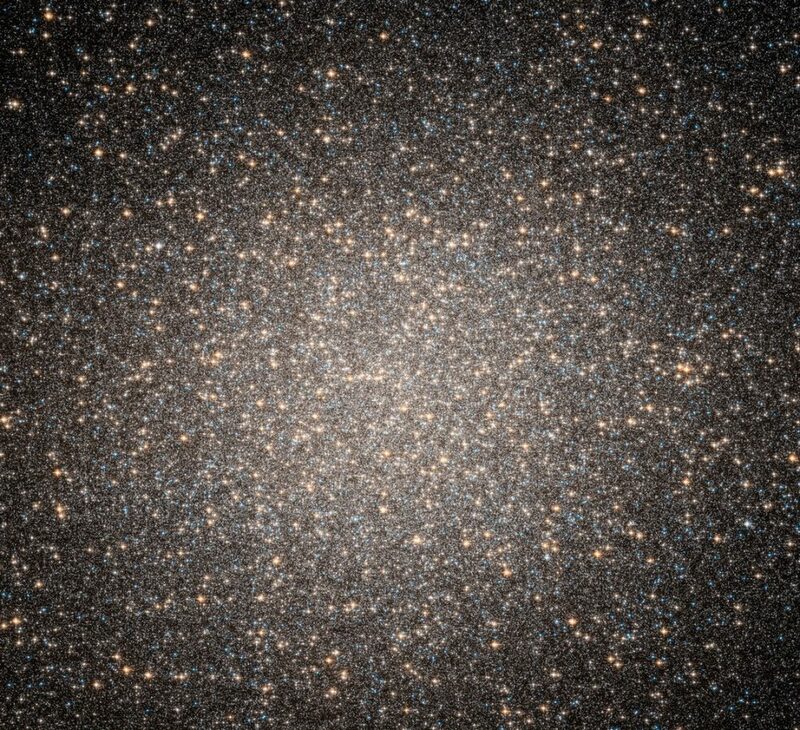 The Omega Centauri cluster has a mass of about 5 million Suns, which makes it about 10 times more massive than a typical large globular cluster and almost as massive as a small galaxy. 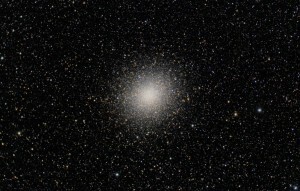 Of all the known globular clusters in the Local Group of galaxies, the only one that is brighter and more massive than Omega Centauri is Mayall II, located in the Andromeda Galaxy (Messier 31). Omega Centauri also rotates a lot faster than a typical globular cluster, and has a flattened shape. Omega Centauri was discovered by Edmond Halley in 1677. Halley observed the cluster from the island of Saint Helena in the South Atlantic. He was the first to list it as a non-stellar object. The cluster was included on Halley’s list of six “luminous spots or patches” in the Philosophical Transactions of the Royal Society, published in 1715. The German cartographer Johann Bayer used Ptolemy’s data when he included the object in his Uranometria, published in 1603. Bayer was the one who designated it Omega Centauri. In his time, stars were labelled in the order of brightness and, as the cluster appeared as a dim star, it got the Bayer designation Omega. Omega Centauri was not recognized as a globular cluster until 1826, when the Scottish astronomer James Dunlop described it as a “beautiful globe of stars very gradually and moderately compressed to the centre.” John Herschel eventually turned a large telescope in the direction of the object and identified it as a globular cluster in the 1830s. Swiss astronomer Jean-Philippe de Cheseaux included the object on his list of 21 nebulae in 1746, and the French astronomer Nicolas Louis de Lacaille included it in his catalogue in 1755 under the number L I.5. Kapteyn’s Star, one of the nearest stars to Earth, is believed to have originated from Omega Centauri. Kapteyn’s Star is a red dwarf only 13 light years distant, located in the direction of Pictor constellation. Omega Centauri is notably mentioned in Ian Douglas’ novel Singularity (2012), which presents as fact that Omega Centauri and Kapteyn’s Star originate from a dwarf galaxy, and their origin is part of the novel’s main plot.